Long gone but a great example of street art on Hosier Lane was this piece by Cezary Stulgis, from 2011 – entitled City Lights. It was approx. 800m x 280cm and the media used was acrylic spray paint. Stulgis was born in Poland and is an accomplished painter, sculptor, street and public artist, whose distinctive work fuses in his terms ‘next-level aesthetics with classical craftsmanship.‘ His involvement in the street art movement stems back over 25 years and he studied art (sculpture and painting) at the Jan Matejko Academy of Fine Arts in Poland. For more information about Stulgis’ art and exhibitions, see his website which also includes videos. For further examples of street art – see my Street Artists page. 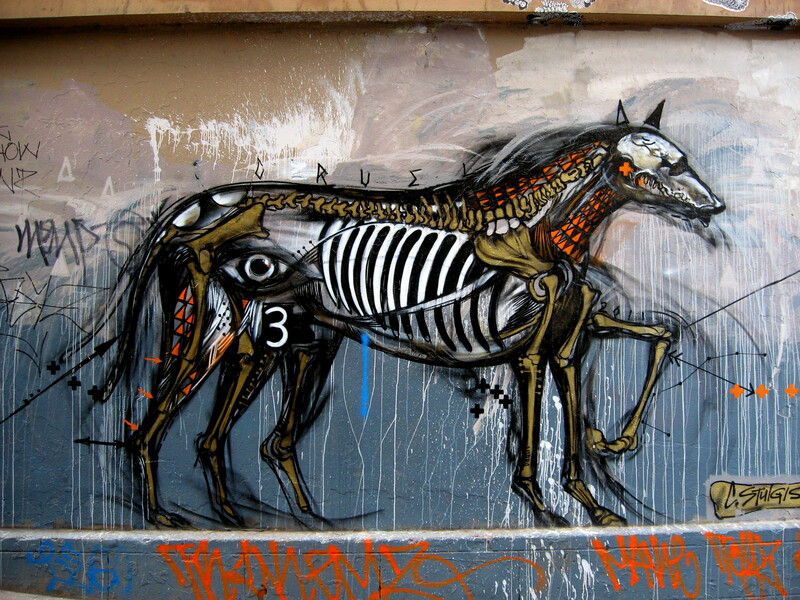 This entry was posted in SprayCanArt, StreetArt and tagged Cezary Stulgis, City Lights. Bookmark the permalink.